Crawl space is traditionally the most misunderstood part of your home. It encompasses many crucial building components of the foundation. 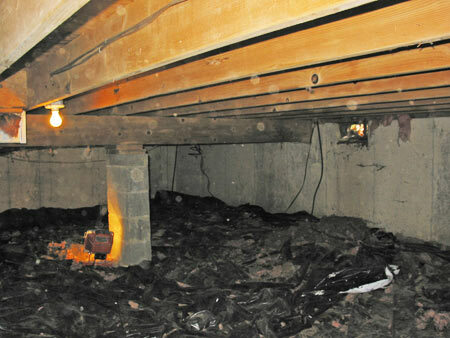 A compromised crawl space endangers the structural integrity of the foundation system. Damage occurs when the environment is moist, exposing joists, sill plate, support beams, subfloor, piers, block foundation walls, etcetera, to undesirable temperatures and water vapor levels. Before. A moist and damp crawlspace affects the entire home environment and endangers the structural integrity of the foundation system itself, in addition to increasing allergens in the home, providing living space for insects and other pests, etc. During. 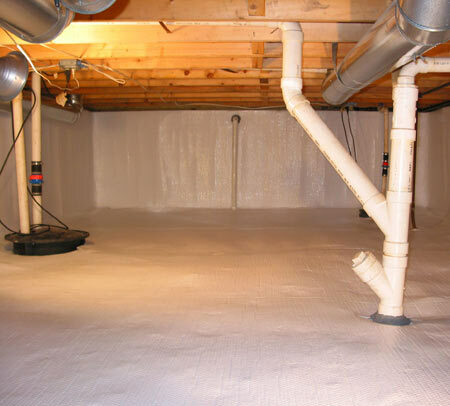 The first step to controlling water vapor and seepage is to seal the walls and floor of the crawl space and includes the installment of a vapor barrier in all areas, including the many nooks and crannies, of the crawl space. After. A clean moisture and damp free crawl space creates a healthier living environment of the home and safeguards the integrity of your homes structure and foundation. Groundwater levels differ according to the amount of rain and snow received. These fluctuating levels are the crux of crawl space moisture problems. If the groundwater level remains near the crawl space grade, water levels can range from complete flooding to smaller areas of standing water. However, crawl spaces can remain moist and damp without appearing muddy or wet due to a number of factors. The enclosed environment of the subsurface soil base, open-earth evaporation, elevation, topography, and exterior perimeter drainage, all contribute to the crawl space becoming very susceptible to mold, mildew, fungus, insect infestations, wildlife shelter, and other microorganisms. Failure to identify and correct excessive moisture in crawl space will eventually damage the structural integrity of your home when structural wood components experience wood rot from mold, mildew, and fungus. The components include the sill plate, joist, beams, and subfloor. Once the structural integrity of your home is compromised, the resale value plummets. Any failure or damage to these structural components can result in shifting and movement at the foundation level. Mold, rot, odors, deterioration, and cracking can all be symptoms of structural or weight-bearing components, becoming susceptible to failing or shifting. When combined with compromised indoor air quality, the following items can indicate a wet crawl space issue: foul or musty odors, respiratory issues, nasal/sinus problems, cold and flu symptoms, increased allergies, etcetera. A foundation repair specialist can determine the source of the concern and recommend solutions. Traditionally, crawl spaces were vented from outside air. Recent studies have led to the push from industry professionals to alter the building codes to require closed crawl space technologies. As the natural airflow pattern in a house is from bottom to top, moist outside air is drawn in through the crawl space vents and up into the living space of the home. 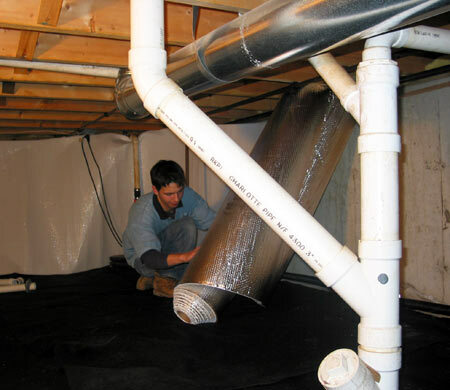 Therefore, even a crawl space appearing dry can disperse water vapor throughout the entire home. Wet or moist crawl spaces can contribute between 10 to 15 gallons of water in the form of vapor throughout the home each day. When water vapor enters the crawl space through concrete walls, slabs, foundation blocks, vents, and the soil. After entering the structure, the water vapor travels upward throughout the home and eventually condenses when encountering the cooler surfaces of walls and ceilings. Condensed water accumulates and saturates inside exterior walls, insulation, up in the roof, and attic spaces. Water vapor raises humidity levels, the growth of mold, mildew, fungus, and other microorganisms is promoted. Inhibiting water vapor from entering the home can prevent significant and costly damages to the structural integrity. Discovering wet insulation, mold growths, peeling paint on exterior surfaces, and damage to roofing materials or the underside of roof sheathing are all indications that the indoor air quality throughout the home has been negatively affected by dampness in the crawl spaces. Elevated moisture levels can even be found in dirt crawl spaces that show no evidence of flooding or standing water. Exposure to mold spores, odors, humidity, insect infestations, and wildlife seeking shelter generates an increasingly unhealthy environment. Children, the elderly, pregnant women, and people with chronic illnesses or existing respiratory sensitivities are at higher risk for adverse health effects of mold, mildew, fungus, and other microorganisms. Crawl spaces with excessive moisture are an ideal shelter for insects and other animals that thrive in damp environments and wet materials. Many homeowners are unaware of how their dirt crawl space is compromising their health status. Chronic allergies, cold and flu symptoms, respiratory problems, nasal and sinus congestion, watery eyes, sore throat, coughing, sneezing, skin irritations, and increased asthma attacks can result from moist or damp crawl spaces. Crawl space drainage systems are the primary and often sole solution to effectively controlling excessive groundwater. Failure to remedy excessive groundwater and moisture in a crawl space can have severe health and foundation structural integrity risks. Air purifiers, ionic and HEPA filters, and other similar devices help to alleviate the associated health concerns, but they do not address the underlying causes or protect the structural integrity of the foundation components. Available options for controlling water vapor and seepage in crawl spaces vary according to each existing home or new construction proposal. Solutions include foundation repair, foundation waterproofing, drainage systems, improving the grade, crawl space sealing system products and systems, vapor barriers,foundation insulation, or a customized combination of products and services. 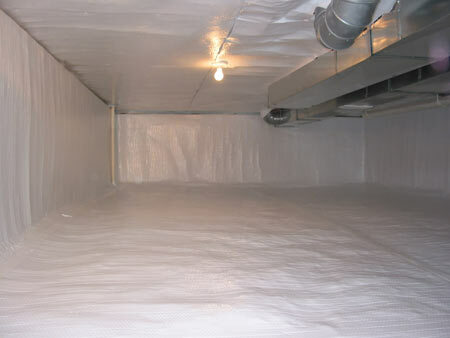 A well-encapsulated crawlspace is not only heathier but can now even be used for dry storage. Shouldn't your crawl space look like this? Excessive moisture can often be controlled with the installation of a full interior perimeter drainage system. Installing a drainage system is accepted as a standard repair option to many crawl space issues. Usually a perforated, corrugated flex drain tile packed in aggregate is installed along the perimeter of the interior walls. The drain tile channels groundwater to a deep-set sump basin with an attached sump pump. Aggregate is packed in the basin and perforated for effective drainage. Next, the sump pump draws water through a discharge line connected underground to an in-ground water receptacle. Sump pumps function well in effectively managing moisture levels and as the last line of defense against flooding. They are designed to expel the water collected from the drain tiles in the deep-set basin before reaching your basement or crawl space floor level. When water reaches the critical level, it is pumped outside through an underground pipe leading away from your foundation. No one wants to deal with the inconveniences of time-consuming cleanup caused by flooding. As most flooding problems occur following severe weather episodes, sump pump systems have been developed with reliable auxiliary power accessories, ensuring continued operation during power failures. These battery backups and extended auxiliary power sources prevent thousands of dollars in financial material losses and structural damages. Crawl space sealing systems were designed specifically by industry professionals to close the crawl space to vented outside air. These systems are the most technologically advanced alternative at eradicating the causal relationship of moisture in the crawl space to odors, mold, wetness, and dry rot. Because the crawl space sealing system isolates the home from the soil of the crawl space, it dramatically reduces air humidity levels. The outcomes are unprecedented and offer a mold-free, radon-free, and insect-free environment, resulting in a more energy-efficient and healthier home. Vapor barriers are useful at minimizing moisture and vapor that drifts up from the open-earth environment of a crawl space. Their purpose is to prevent the transfer and penetration of water vapor from one area to another. Vapor barriers excel at preventing mold, mildew, and other microorganisms from establishing a foothold. They should not be used unless blatant indications of standing water and seepage from groundwater concerns have been ruled out or resolved. Vapor barriers usually serve best as an accompaniment to a drainage system. Foundation insulation does not prevent moisture problems from occurring, but can be a useful support to other resolutions. Insulating the crawl space will help keep the temperature more consistent. Controlling the temperature can help to retard mold growth or other microorganisms from establishing a colony. Foundation insulation is most useful for energy efficiency and works in conjunction with other crawl space solutions to create a more comfortable home. Homeowners alerted to the risks of structural damage and reduced air quality attributed to moisture in crawl spaces will consult with a professional foundation repair specialist. Inquiring on the costs of ensuring a clean, sealed crawl space can also offer much-needed extra storage space while making your home more energy efficient, healthy, and safe for your family. Tip #90. Myth � Egress windows can only be purchased in units including the wells. Truth � Many manufacturers have engineered snap-together components for ease of transporting the units and installation. Therefore, most manufacturers offer windows and wells as separate entities. This option has allowed ease of installation and economical replacement.